Mount Wutai (wǔ tái shān 五台山) is one of the Four Sacred Mountains in Chinese Buddhism. It lies in Xinzhou Region, Shanxi Province. Mount Wutai is the only one mountain in China mentioned by Buddhist scriptures, and appeared in many Buddhist books as well. 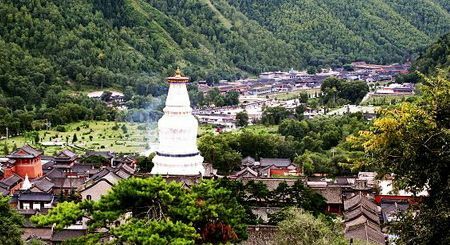 Apart from the aspect of religion, Mount Wutai is also a notable and attractive tourist resort. There are more than 600 kinds of plants; over 150 of them can be used as rare herbs. The splendour of the mountains, exotic rocks, clear waters and green forests make Mount Wutai become one of the popular travel destinations in China. In 2009, Mount Wutai became a UNESCO World Heritage Site. 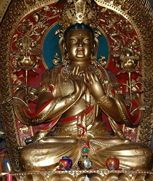 According to a holy Buddhist text, "Manjusri (wén shū 文殊) resides on a clear, cold mountain in the northeast," identified Mount Wutai. The legend said that Manjusri stayed on the mountain and frequently manifested himself as ordinary pilgrims, monks, or even unusual five-colored clouds. A large amount number of Buddhist monasteries were built on the mountain from the 1st century AD to the early 20th century. From Northern Wei (běi wèi 北魏) and Tang (táng 唐) Dynasties, Mount Wutai became a significant Buddhist center. Buddhism achieved zenith in China during this period; as a result, Mount Wutai built hundreds of temples and shrines with more than two thousand monks. To some extent, Mount Wutai witnessed the development of Buddhism in China. It is not only the home of Manjusri, but also related with Tibetan Buddhism (zàng chuán fó jiào 藏传佛教). During Ming (míng 明) and Qing (qīng 清) Dynasties, the construction of temples on the mountain emphasised on Tibetan, or Lama. The founder of the Tibetan Yellow Hat Sect (xī zàng huáng jiào 西藏黄教) went to Mount Wutai to preach in the 15 century. It is said that Shunzhi Emperor (shùn zhì huáng dì 顺治皇帝) of Qing Dynasty became a monk in Mount Wutai. Over all, the buildings on the Mount Wutai display a catalogue of the way Buddhist culture and architecture developed, and had huge influence on palace building in China. Based on the ancient Chinese philosophy, Mount Wutai reflects the harmony between people, religion and nature. The name of Mount Wutai takes from its five rounded peaks (East, West, South, North, and Central), and each of them has a unique natural scenery. Peak Overlooking the Sea (wàng hǎi fēng 望海峰) in the east is an ideal platform to enjoy the sunrise in the morning. Visitors can have the amazing experience of seeing the sun rising above the sea level with rays of light. Hanging Moon Peak (guà yuè fēng 挂月峰) in the west provides a unique angle for visitors to see the graceful and hazy moon hanging on trees in the evening. Peak of Flourishing Leaves (yè dòu fēng 叶斗峰) in the north is famed as the "Roof of Northern China", with the height of 3061.1 meters (10,043 feet). In addition, there is a natural pool which is more than 300 square meters. Splendor Peak (jǐn xiù fēng 锦绣峰) in the south is famous for having loads of colourful flowers during early May to late August. The beauty of flowers and perfumes decorate the peak like wearing a floral coat. Peak of Green Rocks (cuì yán fēng 翠岩峰) is in the middle. On this peak, the moss on the surface makes rocks seems like green. The huge rocks are named as "dragon-writhing rocks", because they look like moving dragons in sunlight. On Mount Wutai, the earliest Buddhist temple was constructed during the Eastern Han Dynasty (dōng hàn 东汉) (25-220). Dating back to the Tang Dynasty (táng 唐) (618-907), 360 temples were built on Mount Wutai. Now, there are still 47 temples with various characteristics existing. It is difficult to find such a large group of temples that display the Buddhist arts in the perspectives of construction, sculpture and painting. Among these temples, Xiantong temple, Tayuan temple and Manjusri Temple are the most famous. Big White Pagoda (dà bái tǎ 大白塔), the 50 meters high Tibetan-style pagoda standing on the grounds of Tayuan Temple is the symbol of Mount Wutai. It is designed by a Nepali in 1301. Another pagoda called Wenshufa also near this temple, and it is said that Manjusri Bodhisattva's hair is preserved inside. Xiantong Temple has the longest history, as it was built in the Eastern Han Dynasty and repaired by following dynasties. Taking up 80,000 square meters, it is one of the largest temples on Mount Wutai as well. The Buddhist Association of Mount Wutai is located here. The construction style of Xiantong Temple is like a court, including seven palaces where Manjusri Bodhisattva's statue was engraved. The bell over 22,000 pounds weight in front of the gate is the biggest one on the mountain. According to the legend that Manjusri once dwelt in the temple, therefore, this temple is also called as "ZhenrongYuan" (real appearance) or "Bodhisattva Summit". It was built initially in Northern Wei Dynasty (386-534), and since Ming Dynasty (1368-1644) it gradually became the principal temple of Lamaism. In Qing Dynasty (1644-1911), both emperors Kangxi and Qianlong visited here and left epigraphs. This is another Lamaist temple set up in the Tang Dynasty. 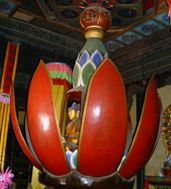 A lotus-shaped flower made by wood is one of the typical wonders in the temple. Carved Buddhist figures are on a square platform inside the flower. In the sixth lunar month, it is the time of Mount Wutai International Tourist Month. During this festival, many Buddhist activities, folk activities, and mule and horse exchange fairs will be held. Meanwhile, visitors from all over the world are invited to join the holy pilgrims and take a tour of Mount Wutai. Due to the comfortable and pleasant climate, Mount Wutai has an alternate name “Clear Cool Mountain” (Qīngliáng Shān 清凉山). It is one of the China’s top 10 famous summer resorts. The average temperature of Mount Wutai is minus 4 degrees. Even in the hottest July and August, it is only 9.5 degrees and 8.5 degrees respectively. Taimo only grows on the peaks of Mount Wutai. There are two types of the mushroom, one has distinctive smell, and the other one is famous for the large silver skin. 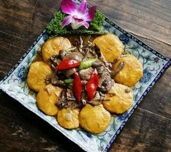 It is also a kind of mushroom with high nutritional value. This dish has a long history on Mount Wutai. Made from natural and sweet water from the mountain, the tofu is delicious and nutritious. The main materials for Si-xi balls are tofu, mushrooms, tomatoes, and cabbage. All of them need to be made into mud, or cut into cubes. Then, fry them with ginger and oil. Finally, boil them into the pot for a while. It is one of the four most important inkstones in China. Different from other inkstones made from a big chunk of hard rock, the stone for Chengni Inkstone is selected from the soft oil near the bed of a local river. Moreover, the stone need to be put in a mold and baked to make the final product. If you are interested in Chinese calligraphy, Chengni Inkstone is an ideal souvenir. You can find a variety of these inkstones in shops on Mount Wutai. Each item has a unique pattern, such as animals, plants, historical figures and some famous national stories. Mount Wutai is located 240 km (150 miles) to the north of the city of Taiyuan. By plane: Taiyuan is the nearest airport, which operates flights to/from all major cities in China. From Taiyuan, you can take a bus to the village of Taihuai, and then transfer another bus from Taihuai to Mount Wutai. The fare is CNY 70 to each of the five peaks. By train: There is a night train K601 from Beijing to Mount Wutai, which departs at 22:22 and arrives at 04:31. By car: From Xinzhou City, it takes two hours to drive a car to Mount Wutai. 1. Mount Wutai is a Buddhist shrine; therefore, visitors should keep quiet and respect the rules in the temple. 2. There is big temperature difference between morning and noon, it is necessary to bring with the thick and long sleeve clothes. 3. With strong ultraviolet radiation, it is better to take some sun care cream. 4. The best period to travel on Mount Wutai is during July to August. 5. If you are taking a self-drive tour, you must pay attention to the spiral mountain road and drive carefully.